culture in a ceremony yesterday. Genoa Keawe and Violet Pahu Lilikoi have performed together for 64 years, been close friends for half a century, and these days refer to one another as sisters. The musical legends yesterday were the recipients of the Duke's Canoe Club Waikiki 2000 Ho'okahiko Award for their "role in growing Hawaiian music; and their pioneering efforts in teaching other countries about Hawaiian culture." The award honors those in the community who have made it their life quest to exemplify the cultural values and traditions of Hawaii. Keawe and Lilikoi began their musical careers with "Boat Days" at Honolulu Harbor, playing ukulele and bass while serenading arriving passengers. Their Waikiki connection is remarkable. They started singing at the old Waikiki Tavern on Kalakaua Avenue; at the long-gone Hawaiian Village with Alfred Apaka; at Fort DeRussy; and then spent 18 years at the Ilikai Hotel. They were discovered by Lucky Luck and asked to appear on his television show, "Lucky's Luau," where they stayed for five years. 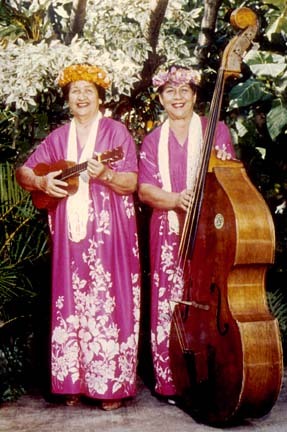 Today Keawe performs Thursday evenings at the Lobby Bar in the Hawaiian Regent Hotel; Lilikoi's passion for Hawaiian music was passed to her daughters, who perform nightly at Duke's Waikiki as The Lilikoi Sisters. Keawe and Lilikoi also received certificates of appreciation from the City and County of Honolulu and state House of Representatives. The first Ho'okahiko Award was presented last year to Puulani Mossman, a former Matson poster girl and hula dancer.